"Son of Rambow" has unfortunate timing, released after "Raiders of the Lost Ark: The Adaptation" toured the country and "Be Kind Rewind" branded homespun VHS fandom as "sweding." Yet "Rambow" is quick to clear the cobwebs, introducing itself as a bracingly hilarious, heartening, and visually elastic comedy about the bliss of big-screen replication. A timid English boy raised in the strict Plymouth Brethren religious sect, Will (Bill Milner) isn't allowed to watch T.V., so he entertains himself creating elaborate drawings, helping him mourn the loss of his father. Into his life comes Lee (Will Poulter), a bully who takes a shine to Will's gullibility, bringing the boy into his plan to create a stunt video to send in to a BBC filmmaking contest. However, when Will gets an accidental look at a bootleg of "First Blood," the visuals plow through him like electricity, and the boys set off to make "Son of Rambow," a video project that sparks Will's disobedient side, challenges Lee's emotional frigidness, and brings a fashion-forward French exchange student (Jules Sitruk) into their tight brotherhood, opening a whole new social acceptance that tempts Will's innocence further. "Rambow" (misspelled in the heat of Will's enthusiasm) is a magnificent merging of edgy comedy, wild squirts of imagination, and the indefatigable spirit of director Garth Jennings (billed as "Hammer & Tongs" with producer Nick Goldsmith), who plunges into this inescapably enchanting farce with a lofty vision for the mileage of pre-pubescent creativity. Coming off his clever work on "The Hitchhiker's Guide to the Galaxy," "Rambow" brings Jennings back down to Earth, looking to probe the mind of children as they cope with death, religious restriction, and unexpected friendship. At the core of this strange odyssey is a love for cinematic escapism, and Sylvester Stallone's iconic "First Blood" is the psychological bullet that's shot into Will's head, melting his innocent brain. Using whatever locations and props they can find, Will and Lee dress up as Rambo and Col. Trautman and head off into the backyards and abandoned lots of their neighborhood, embarking on Gilliamesque adventures that combine 80's era VHS equipment, jagged animation, and unbridled affection for the orgasmic displays of violence that "First Blood" tenders. For Will, Rambo is a conduit for his emotional release, allowing him an opportunity to confront his father and constricting religious issues. For Lee, the horseplay thaws his exterior, permitting him a companion after years of making himself a nuisance at school and to his beloved, but elusive, older brother. Jennings takes the boys on a vibrant journey, filling the frame with insane details of kaleidoscopic imagination and a commitment to extract the finer points of behavioral nuance out of every single shot. It's a fearless piece of filmmaking, bringing overwhelming swells of personality to the screen (scored to new wave and pop gems of the 80s), at times risking suffocation from all the razor-sharp whimsy. The artificiality is balanced out by Milner and Poulter, two acting newcomers who register with such apple-cheeked freshness, you can't take your eyes off of them. They humanize Jennings's outrageous appetite for silliness with their delectably unvarnished acting skills, helping the material discover unpredicted laughs and tears along the way. "Rambow" looks to insert some third-act tragedy to illuminate a pathway to a heart-tugging finale, and it feels artificial when the rest of the picture is working so intently to establish sympathies through endearing comedic articulation. It's easy to forgive the trivial removal of bravery when Jennings rolls out a superb finale, showing off the finished "Rambow" film and tiding up loose character arcs elegantly. "Son of Rambow" is a delightfully eccentric fantasy, flush with laughs and displays of fantastical ink-stained escapism; an unforgettable triumph of heart and giggles. One of the few assuredly must-see films of 2008. 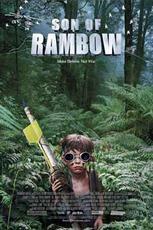 Buy tickets to "Son of Rambow" now!